On conquering my Everest, meeting a Princess & a Pollockian moment! This Sunday was filled with Birthday cakes, playing in a Tippee & a first meeting with our friends’ new Baby Girl. As usual on foggy days, I feel courageous, and decided to tackle one of my most irrational fear: Meringue to bring as an edible gift! These crumbly snow colored beauties have always puzzled me! to be perfect, they must be insolently crisp on the outside, chewy on the inside, the sweetness balanced & the color a gentle ivory! I blame my anarchist approach to baking for all the failed attempts until now. This version is so simple and forgiving even the most unstructured baker could pull it off; the cool Pollock effect is simply achieved by drizzling different type of chocolate or candy melts on top of the mixture before forming them with 2 spoons. Don’t you love these Pollock patterns and how they are whimsical and hypnotic ? There is strange perfection in how your eyes get tangled in the intricate waves and lets your mind wander for a minute too long! 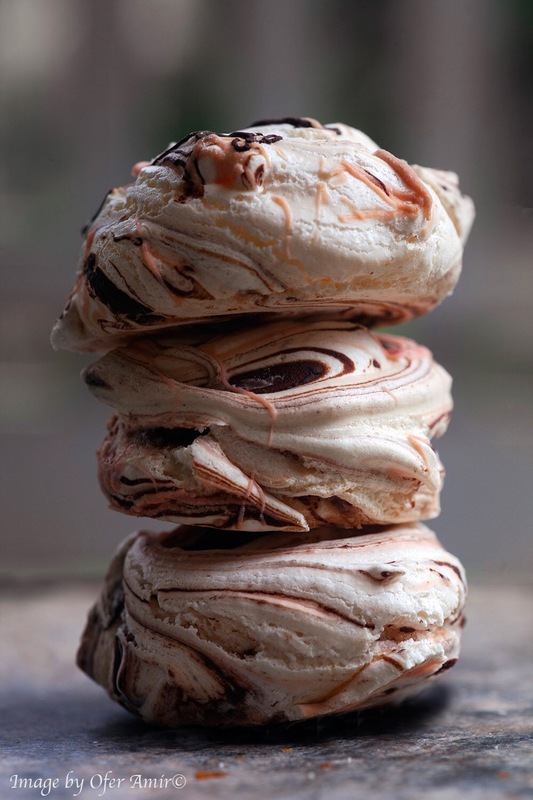 Directly in the bowl drizzle the chocolates with a fork on top of the meringue mix – Do not mix it in or the marbling effect will not be as visible; instead simply lift the meringue with a large spoon. Place it to the tray covered with a parchment paper (you can use a second spoon to move the mix to the tray). You can add some more drizzles on top to accentuate the effect – Go ahead and be bold, drizzle in wide movement & let your inner Artist come out! If you are patient enough you can wait for a full evening as they will get better the day after! No one will judge you if you can’t as the delicious scent of chocolate and orange blossom are so intoxicating you may not be able to resist it! Credit for inspiration: @PreppyKitchen for the gorgeous Marbling effects & HummingBird High for adding Orange blossom to the meringue!